I have been trying to update my xubuntu version but it keep saying there's no enough space on disk. The window says me to execute "sudo apt-get clean" but I have no answer. It just don't do anything. How can I free space on disk if "sudo apt-get clean" is not working?? Doing sudo apt-get clean will remove the packages all the local copy of the packages that you may have downloaded when doing an installation. This will almost empty the /var/cache/apt/archives directory. /var/log which contains most of the log for your system. You may want to delete the old logs. You may want also to tweak the configuration of the logrotation program to reduce the amount of logs saved and archived. In the file /etc/logrotate.conf and all the files present under /etc/logrotate.d looks for the line beginning by rotation. The number after means how many logs are kept on the system. /tmp, /var/tmp and any other tmp directories found on the system. Your own Trash folder may be full of items that can be purged. In your home directory, there is a Download folder, maybe it is full of things you don't need anymore and can be safely deleted. And these are only the few general things I'm thinking about. Depending on how you use your system (applications installed and so on), there may be some other directories to check and to empty. As is common with many of the commands you can run from a terminal, apt-get clean will only give a response if there is an error. If the command completes successfully then you will just be returned to the prompt. 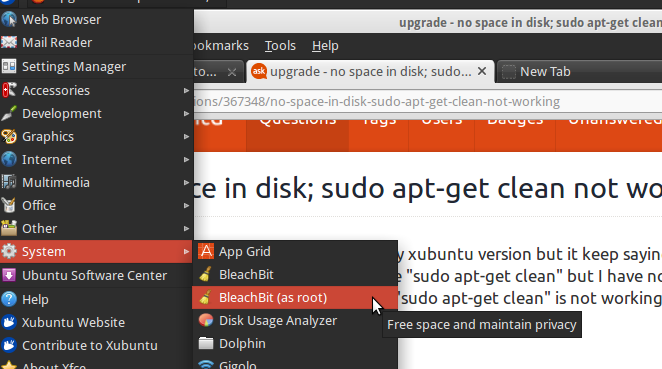 you can install it with sudo apt-get install bleachbit and also from software-center. after installing it , you can launch it from System -> Bleachbit(root) . so that you can clear maximum of useless data. Not the answer you're looking for? Browse other questions tagged upgrade sudo disk or ask your own question. How can I upgrade a netbook with low system memory?